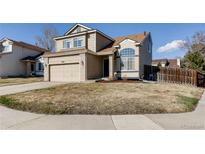 Below you can view all the homes for sale in the Park View Commons subdivision located in Centennial Colorado. Listings in Park View Commons are updated daily from data we receive from the Denver multiple listing service. To learn more about any of these homes or to receive custom notifications when a new property is listed for sale in Park View Commons, give us a call at 720-924-7403. Showings begin at open house, Sat Apr 6th 11 am - 3 pm, stop by to see this home! MLS#6161147. United Real Estate Prestige Denver. * Finished basement with Rec room and a bathroom with a Shower with beautifully tiled walls * Large backyard with privacy fence MLS#9345960. Keller Williams DTC. This awesome Cherry Creek School District home has it all! MLS#5837857. HomeSmart Cherry Creek Properties.